When it comes to finding a salad that meets your cravings and keeps you satisfied for the rest of the afternoon, we know that not every salad makes the cut. After all, you’ve certainly eaten a salad and then found yourself ravenously hungry just an hour later. We know we sure have! So when you are ready to indulge in a salad that goes above and beyond what you think a salad can be, it’s time to come to Montana Jack’s restaurant in Missoula! When you choose to cater with our team of professionals, you can choose two of the following salads to delight the tastebuds of your guests for your next big event. Reach out to us today to get started and let us know how we can help you! You don’t need to get too crazy to enjoy this crowd favorite! We use iceberg, romaine, and spinach all tossed together to create the foundation of this salad. Next, we throw in some cucumber, carrots, and tomatoes. 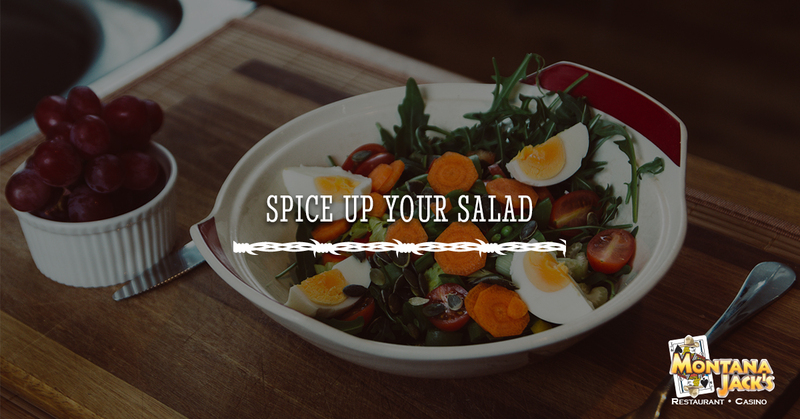 Whatever your favorite choice of dressing may be, we can make it happen to add the flavor you want to your salad. You may think that baked potatoes and their cheesy ingredients could never combine with a salad, but you would be mistaken! We have compiled potato and skins, bacon, cheese, green onions, and dressing all mixed together to create an indulgent salad that will keep you full all day long. If you like your salads to be on the sweet side, then we are here to give you what you want without feeling guilty about a little indulgence. Our spinach salad is packed with spinach leaves and tossed with raspberries, candied pecans, and raspberry vinaigrette. This salad has a base of penne noodles that is topped with bacon, ranch dressing, cheddar cheese, broccoli, tomatoes, and green onions. You are sure to love this combination and your guests won’t be able to get enough! We have combined corn, onions, cheddar, chili cheese Fritos, and dressing to make a fun salad side dish that everyone will be raving about. There is nothing wrong with the classics! We use potatoes, celery, onions, eggs, and traditional dressing to pull this family favorite together. Choose this salad option as the perfect complement to barbeque food. Whether you are in need of a caterer you can trust or you just want to find a fun place to go for dinner, contact Montana Jack’s! We know we’ve got food favorites for the whole family to enjoy. Come out with your friends or bring the whole family—whatever you choose, you will absolutely have a great time. We also offer fun casino games for the adults to enjoy! Who said dinner can’t also be play time? When you have an event you need us to cater, we would be happy to help you construct a buffet for your guests. We will see you tonight, and we look forward to your call!